Vertical hydraulic platform lift operated internally by push buttons on the platform. The A3000 can be operated just as easily by a wheelchair user or by a wheelchair passenger and an attendant. With a hydraulic remote power pack and a stylish, sophisticated appearance, the unit travels between levels smoothly and quietly. It is a simple to use and easy to install solution which allows access between different levels both internally and externally. Operated by manual or automatic power operated doors/ gates, the wheelchair user enters the unit with the doors/ gates closing behind them. 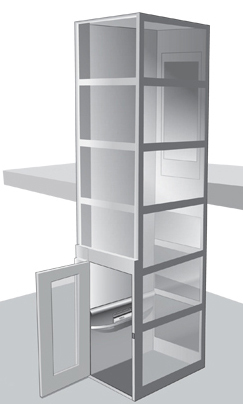 This lift offers a safe, convenient and reliable means of ascending and descending between floors. Shaft and doors can be powder coated to any standard RAL colour. No requirement for a lifting beam at the upper level. 85 mm recess or ramp available to the lower level. Automatic shaft lighting or LED lighting to reduce power consumption. One touch landing call buttons. Carriage panel: Standard ABS pearl finish. Steel work: High quality textured powder coat finish. 900 x 1250 mm: 400 kg. 900 x 1400mm: 400 kg. 1100 x 1400 mm: 400 kg. 85 mm, or can be used with provided ramp. Up, down, stop and alarm buttons on platform. All push buttons are illuminated with a raised profile. Steel infill to lower section/ full glass enclosure. Steel locked cabinet located within 5 m of the unit, 800 x 1125 x 350 mm (w x h x d). Opening size: 1025 x 2000 mm single swing door (w x h). Pipe break valve: Fitted to the cylinder to arrest any fall in the unlikely event of a pipe rupture. Hand lowering: From the lowest level bringing the trapped person towards the rescuer. Emergency access: By special supplied key through the entrance doors to the lift. Emergency lowering: Simple hydraulic valve located in control cabinet. Emergency stop button: Fitted to the platform console. Safety edges: Provided around the edge of the platform and also between carriage and shaft wall to stop travel if contact is made. 240 V single phase, 50 Hz, 13 A lockable isolator. 1120 x 1400 mm shaft size. 1120 X 1550 mm shaft size. 1320 x 1550 mm shaft size. For travels up to 3000 mm travel.